Nan and Jinny St George have both wealth and beauty in generous supply. In the New York society of the 1870s, however, only those with old money can achieve the status of the elite, and it is here that the sisters seem doomed to failure. Nan's new governess, Laura Testvalley, herself an outsider, takes pity on their plight and launches them instead on the unsuspecting British aristocracy. Lords, dukes, marquesses and MPs, it seems, not only appreciate beauty, but also the money that New York's nouveaux riches can supply. A love story of love and marriage among the old and new moneyed classes, The Buccaneers is a delicately perceptive portrayal of a world on the brink of change. The Buccaneers is a fun tale from start to finish. It's fascinating to follow the lives of the girls through many ups and downs. 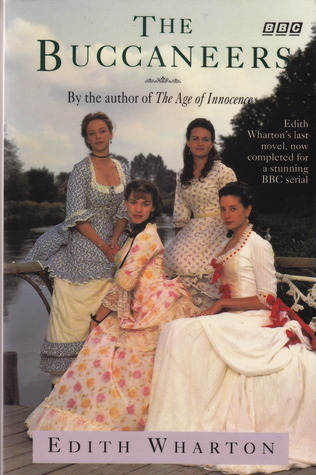 The edition I read includes an ending by Angela Mackworth-Young based on Wharton's synopsis and the way they presented the story in the mid-90s BBC adaptation, because Wharton died before she finished writing the book. I'm not always sure Wharton would have presented the characters in the exact way Mackworth-Young does, but it is at least better than leaving the reader hanging mid-story. Interestingly I do feel sorry for a couple of the men as much as the women, because in the marriages that don't work out, it's sometimes no one's fault; they simply wanted different things and didn't understand each other. Anyhow, this is a fun, easy reading classic that I highly recommend.